I decided to make an easel card this week, my design papers are retired from Stampin' Up. I used SU's Just Believe and Silhouette Sentiments along with SU markers to color. 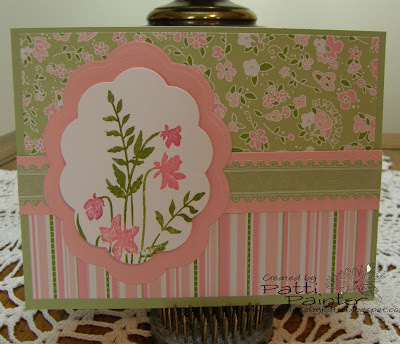 I love doing these easel cards and this color combo is so pretty for the first day of Spring. Hope you are all having a great weekend! Wow, look at you go girlfriend. Such a pretty spring like card. Lovely card...good luck on the challenge. Another stunner! Love that paper... to bad it's retied! Beautiful card, Patti! I love the papers and the easel design! Perfect for the challenge! What a pretty easel card! Your colors are so soft and springy. Your card is so pretty. I love the stripes with the small floral paper. Pink and Green are one of my favorite colors together too. Great job! 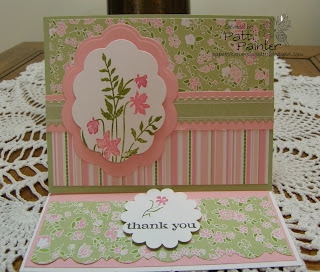 Thanks so much for joining us for Joan's Gardens #10 Weekly Card Challenge. Your entry is beautiful! Congrats, Patti. This is one lovely card. Congratulations Patti on your win this week at Joan's Gardens. Your card is gorgeous. Congrats Patti, your card is beautiful. Congratulations Patti, your card is gorgeous.